Miracle Ka&#8217;mora Pegues, 2, passed on Saturday, February 3, 2018. The family of Miracle Ka'mora Pegues created this Life Tributes page to make it easy to share your memories. 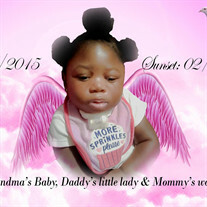 Miracle Ka’mora Pegues, 2, passed on Saturday, February 3, 2018.